Nakajima Atsushi was kicked out of his orphanage, and now he has no place to go and no food. While he is standing by a river, on the brink of starvation, he rescues a man whimsically attempting suicide. That man is Dazai Osamu, and he and his partner Kunikida are members of a very special detective agency. They have supernatural powers and deal with cases that are too dangerous for the police or the military. They're tracking down a tiger that has appeared in the area recently, around the time Atsushi came to the area. The tiger seems to have a connection to Atsushi, and by the time the case is solved, it is clear that Atsushi's future will involve much more of Dazai and the rest of the detectives. This show is fantastic. There's only 6 episodes out thus far but I've loved every single one of them. Its creative, funny, and puts limitations on the characters' powers to prevent them from becoming all-powerful (a trope that's all too common, especially in anime). The animation is stellar and I can't tell you how much I love the art style, making all of the powers (which I won't describe here because spoilers) a joy to watch. The characters are unique, likable, and funny, presenting plenty of contrast between the major characters to make for some hilarious situations. The story focuses on Atsushi, an orphan boy living on the streets who after being kicked out of his orphanage through a turn of events manages to join the Armed Detective Agency, an Agency that specializes in dealing with threats from those who are Gifted - as most of their members are - that the police don't stand a chance against. My only complaint with the show is the number of times Atsushi has flashbacks to getting kicked out of the orphanage; it gets kind of repetitive, but because of all the other things working in this show's favor I'm willing to overlook it. In short this show is definitely worth a watch if you're looking for a new series to try. 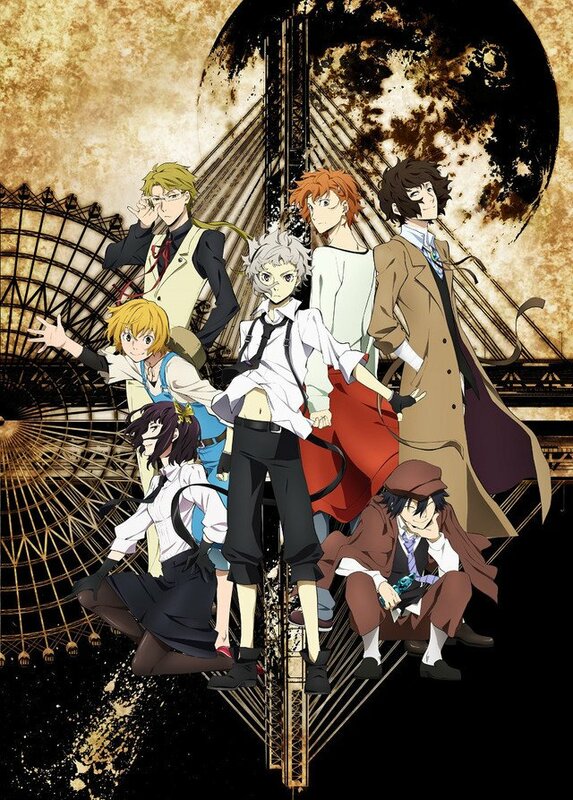 And if you finish all the episodes and still want more Bungou Stray Dogs, try the manga like I did, its worth your time. I have only watched the first 12 episodes which have been dubbed by Funimation so far and it's pretty good. The anime is about a boy called Atsushi, who is living on the street because he got kicked out of an orphanage. Then he is found by two detectives and is recruited to the Armed Detective Agency, this is an agency that deals with threats from those who are gifted with superpowers. My favourite thing about the series is the relationship with the two main detectives can't remember their names but one is always strict and determine and the other one is for laid back and for some reason has an obsession with suicide. Also the main villain is pretty good. In terms of animation, art style and character designs are pretty rad and cool. Like the person above me has mentioned my only complained being the repetitive use of Atsushi flashbacks being kicked out of the orphanage but other then that it is pretty good. I also think some of the characters are weird like that girl who has a fetish over her brother and that creepy nurse and her terrifying treatment (Watch episode 4 and 9 if you know what I mean). So far it's pretty good I just hope Funimation continue to dub the rest of the series so I can go in a bit more detail. If you want something new and fresh from Funimation I would recomand this series.